Nice set of photos with this one. Yet one more bird that I have never seen. Thank you Julie! Which picture of the single bird are your referring to: the walking one, or the flying one? I love the bird on the left in the second photo – such a sweet expression! 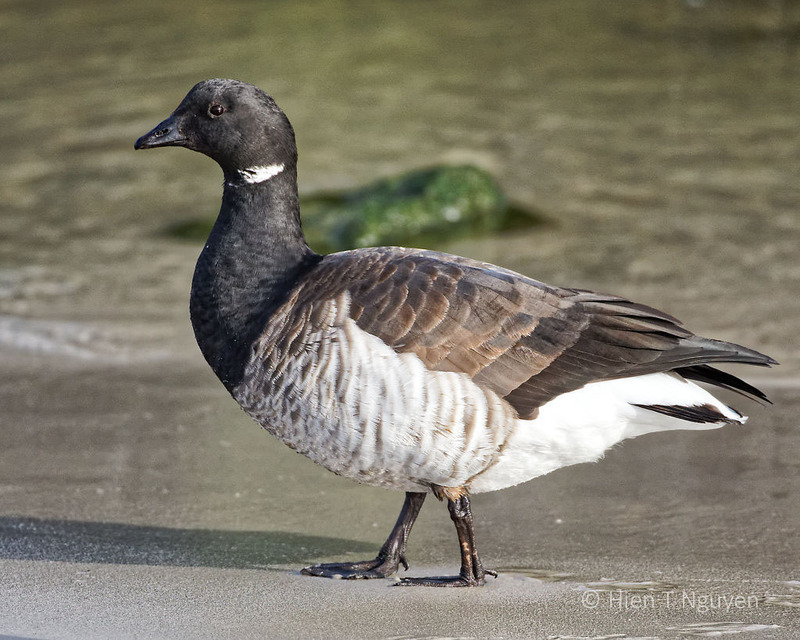 I have great memories of walking along the beach in winter on Staten Island and getting close enough to groups of Brant to hear their low murmuring as they move through the surf along the shoreline. The third photo is yet another perfect in-flight image, Hien! Thank you Lynn! 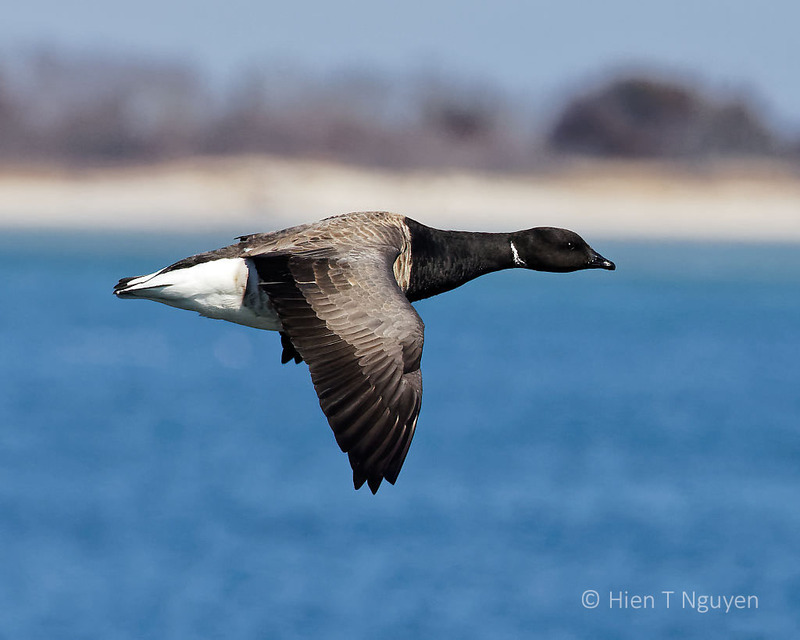 I have one more in-flight photo of the same Brant. It is perfectly horizontal and I will post it one of these days. Nice shots. 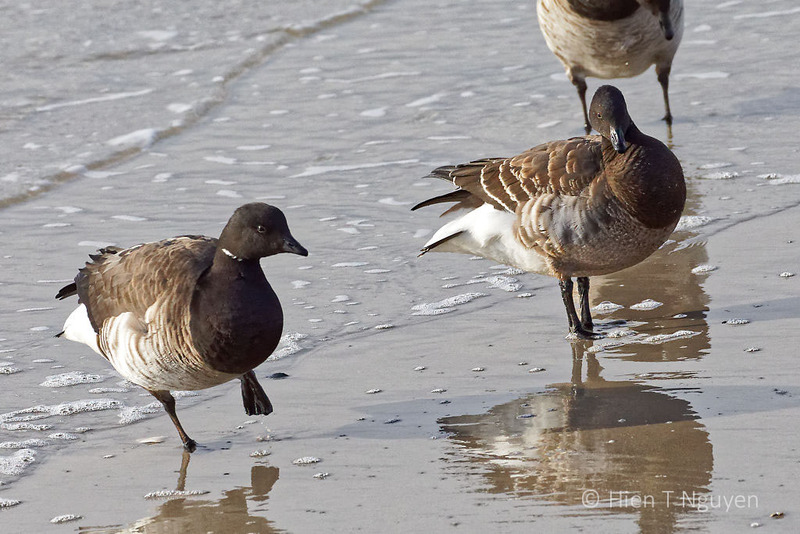 We get several thousand Dark- bellied Brent (Brant) over-winter here in Norfolk UK, occasionally we have a few pale bellied but in the UK they are mostly in the west and Ireland. Thank you for visiting and commenting! You have a beautiful and interesting blog, and I have just clicked on the follow button. 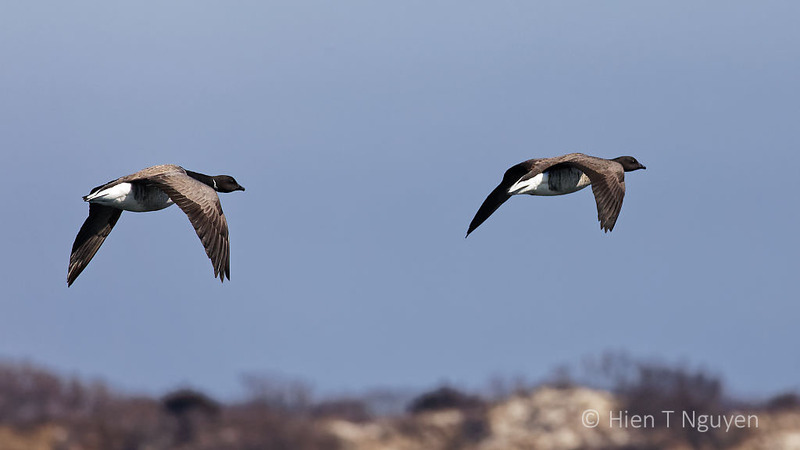 We can always tell the Brants from the Canadas by their milder honking as they fly. You are right of course! It’s one of the reasons to like Brants more than Canada Geese. He a stocky chap. I particularly like that first photo. Beautiful images, Hien! 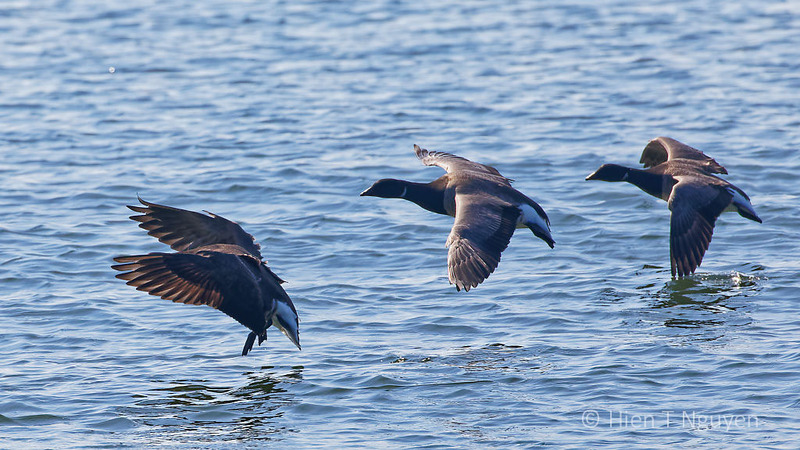 I’m still looking to capture my ‘first’ Brant. 🙂 I’ve heard they will mix in/alongside the Canada or Snow Geese on land. Have you seen them do this or do they keep to their own flock and area? I’m always going through my photos of large flocks of geese, looking for possible Brants. Thanks Donna! I have not personally seen Brants mix with Canada Geese or Snow Geese. 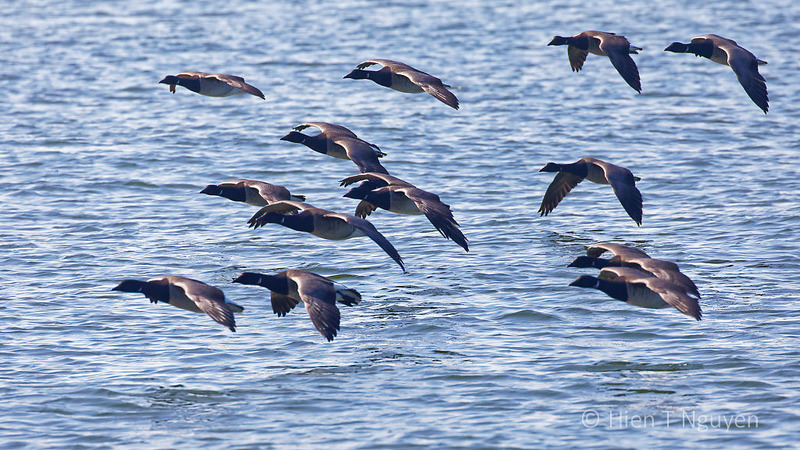 Usually, from afar it is possible to misidentify Brants as Canada Geese. But once you come closer to them, and see more details, especially the smaller bill and small size, you can then tell whether they are Brants or not. It does look a bit like a miniature Canada goose, to me. The coloring? It does look like a Canada goose, but is noticeably smaller, and its bill is not as pronounced. It also does go back to the Artic, whereas the Canada geese stick around all year long.